It may look like a scarf, but it will be a clutch bag after it's blocked and sewn. I found a great place to buy wooden handles online. They seem to have a little bit of everything. Check it out! Funny story regarding Clapotis II..... When we were at the beach, I wore my clapotis to dinner and when we were walking back to our rooms my sister said, "I just love that shawl. If I paid you, would you make me one?" As it happened, I took along the clapotis that I made for her birthday and I was going to give it to her a few days later. After she said that, I couldn't wait and I had to give it to her that evening. Boy was she surprised! I think she really liked it. I'm glad I got it finished. 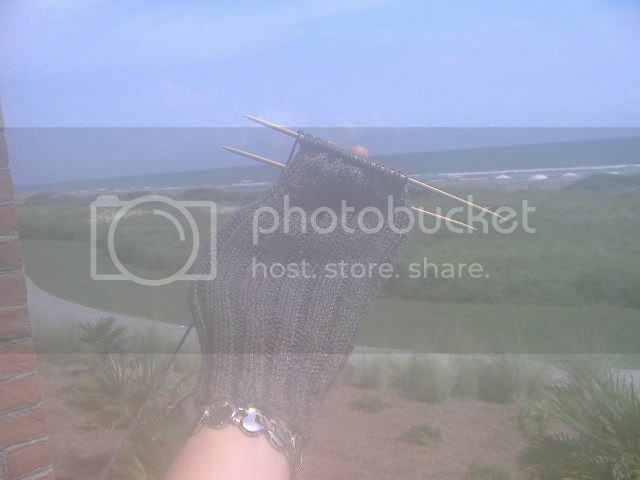 I'm not sure what happened to this photo or why it's so blurry but hopefully you can see I made good progress on the sock at Kiawah. I didn't have much time to knit but I got some in between the beach and dinner one evening. Kiawah is gorgeous. And The Sanctuary is awesome. But it's back to reality for me! I'm off to Kiawah! See ya'll next Monday! In a perfect world, that neck would have had a few more rows on it but I'll take what I can get without using the brighter blue right at eye level. That would stand out like a sore thumb. It's doable the way it is I think. I was VERY lucky here. Socks and scarves.... here I come!! I have sock yarn out the waazuu and I'm diggin in! 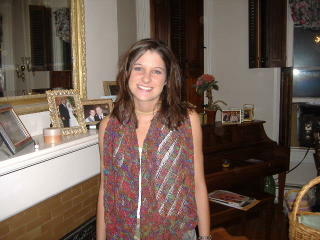 And once again the lovely Cate agreeing to model the (finally) finished Clapotis II. I worked some magic on the "flaw" and it is no longer an issue so it will go to my sister for her birthday on the 28th. I just love it but I'm glad it's finished. 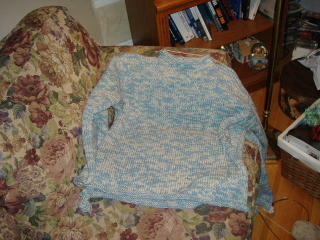 I worked on the the "big blue" monstrosity sweater last night after I got the clapotis finished. I finished the sleeve in the brighter Cascade 220 that my Seattle friend was kind enough to send. To me it's very noticeable but it might not be so apparent to other people. The good thing is that it is two yarns held together and the other one is the same. Tonight I will finish the rolled neck with what I hope is enough left over of the original blue. I just have to pray that there is enough because I really don't want to have to use that brighter blue around the neck. I think that we can safely say that by this time, if I was going to find the Cascade 220 I needed, I would have. It's just not out there. I exhausted every avenue and I'm just tired of looking at an unfinished sweater. I also took stock of my stash last night. While I KNOW it's not as bad as some, it's pretty bad. I will dig into this stuff now to finished up some Christmas gifts and then concentrate on some baby stuff. I've got babies (of nieces) coming in January and February. One is a girl. YAY. So much easier to knit for girls. After babies..... ROGUE!! I called Ireland this morning to order the other two skeins of yarn I will need to complete Rogue. knit this cabled hooded pullover :: rogue :: the girl from auntie I got a little old man on the phone with a decidedly yiddish accent with just a hint of brogue. Geez, that was a first! He was just the cutest thing. An Irish Jewish Elderly MAN selling yarn in an Irish yarn shop. I think he's one of a kind! Of course it will be a hundred years before I attempt to start that project with everything else I have to do before that. But I'm still excited about it. It will have a special meaning since my daughter, who doesn't knit, bought the yarn for me in Ireland. Speaking of her, it hasn't been a good week for the O'Connors.... she lost ALL of her digital photos from Ireland when her computer hard drive crashed last week. She is going to try to have them recovered by someone who specializes in that so I'm keeping my fingers crossed for her. She called me crying when it happened. And THAT is why I sent all my digital photos to snapfish.com last week and had them put on CD's. (I don't have a burner) At least I feel safer about that now. On the stolen vehicle front, we heard that two other vehicles were taken in our little town in the last month as well. Both in broad daylight and at lunchtime. I think we have a thief stealing cars on his lunch hour! None of the other ones have turned up either so I guess we better get car shopping and in a hurry. Well I know from the sound of it you would figure it has some ethnic meaning, however, we just had a little fun day appreciating the dog.... whose name is Irish. My daughter said, "Mom, Irish is 9 years old and we never even celebrated her birthday once." This is true. So, we devoted a day to spoiling the dog a few Sundays ago. 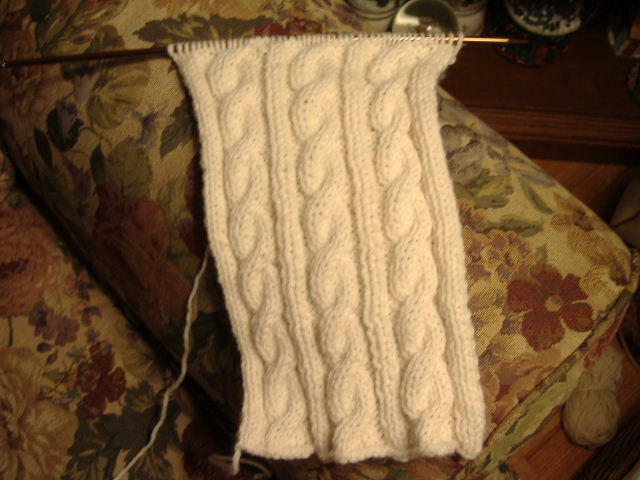 And since there is no knitting news to speak of, I'm subjecting you to this. She got new toys, doggie ice cream, and a trip to the park. The whole thing was so ridiculous that I didn't even have any trouble getting grown kids, spouses, and significant others to appear. I think they came just to find out if I was nuts enough to actually do it. But they got a great brunch out of it afterwards. I said there was no knitting news, but actually there is. I screwed up Clapotis II big time over the weekend. It's funny. I never had one minutes problem with it the first time around but over the weekend I found myself one stitch off on a row. Do you think I could find the problem? No. 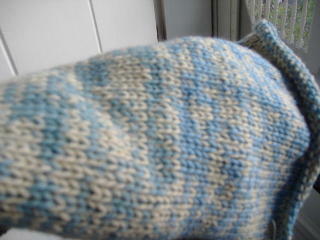 So, I did what any novice knitter would do. Whatever I felt like doing at the time. And what happened when I dropped the next stitch? Well, it ran down the piece alright. And the whole thing started to unravel at the edge. Obviously it was not a stitch that was supposed to be dropped. So, I stopped the bleeding at the bottom with a slip stitch to hold the thing together and I think from here on in it will be okay. I dropped the next stitch and it was successful. So, now I think that I will keep this one too because it is "flawed". I can wear it but I wouldn't want to give it as a gift. And in case you were wondering, our van has not been found which really bites. I keep expecting to wake up and find it sitting outside the house, returned by a remorseful individual who saw the error of his ways and wanted to repent and beg forgiveness. Yeah. Right. Anyhow...this is what it looks like. You have to wonder what the attraction was. I'll start this story by telling you that I live in Hollidaysburg, PA which is the county seat of Blair County. It is a picturesque, historic little town. Crime is low. Sure, things happen here as in every community in the country but real crime is pretty rare. I live on a tree lined street beside a big stone church in an area that can boast of few problems at any given time. I actually live in the historic district with a plaque on my house that is supposed to mean that the house is somewhat special but what it really means is that we can't do the improvements we'd like to due to a bunch of bleeding heart preservationists wh0 have a stroke everytime we mention the words "vinyl siding". Anyhow, our car was stolen on our lovely street today, in broad daylight, right in front of our house. Were the keys in the ignition and the doors unlocked? Yep. Have we always done that when we knew we would be going back out shortly? Yep. Is that stupid in this day and age? Yep. But in our defense, living in a community such as this spoils you to the point of stupidity. me get these two sweaters out of my system! I have 4 projects in progress, about 30 rolling around in my head, and I can't get these two out of my mind... and don't forget about the Irish yarn and Rogue! Have I mentioned baby projects? We're having a population explosion in this family currently and I have to/want to knit for babies too! There definitely are not enough hours in the day to knit. Maybe I can knit on vacaton... I don't know... I'm not much of a beach knitter. Does anyone like to knit on the beach? I just think sand and suntan lotion don't mix too well with yarn. I'm more of a beach reader than a beach knitter. In any case, Kiawah Island on Aug. 23rd and I CAN'T WAIT. This trip is my sister's birthday gift to me. This is a BIG birthday folks. I think this was my sister's way of keeping me from jumping off a bridge in a fit of depression over reaching the half century mark. I took this photo just to make sure I could. My old camera wouldn't do a close up but this new one seems to work okay. This project is coming along. I love the colors. I don't think I'll have any problem getting it finished before Aug. 28th. You would think this would be boring but the pattern is addictive! I need some suggestions for a good baby project. Or a good baby pattern book. Send some my way! Thanks! A quick critique... because I only have 15 minutes to leave for an appointment! 1. winsome eyelet pullover - Cute but I don't like bell sleeves. I wouldn't wear it and I wouldn't knit it. 2. circle cardigan - very creative and cute. Not me. I wouldn't wear it but I think it would be tons of fun to knit. 3. devil-may-care tie - there isn't much I like about that at all. Not the shape, not the color.. nope... nada. 4. Debbie Bliss cardigan - That is cute. But I don't like sweaters with a tie closure. 5. stunning gloves - stunning, yes. practical no. I think of gloves as being practical. I'd never wear them and I certainly wouldn't take the time to make them. 6. ankle brushing skirt - Way too big a project. Way, way too big. And I'd never wear it. 7. Bell sleeve pullover - what did I say about bell sleeves?? 8. Sasha Kagan's top and hat - Love it. But it's too complicated for me and just something I would aspire to eventually ... but not anytime soon. 9. Purple sweater - LOVE IT! But I don't like the neck. Love the design, don't love the neck. Did I mention I don't like the neck? 10. Orange cable cardigan - Love the sweater. I'd take the time to make this one. But not in orange. 11. red cable pullover - too... um.... trendy? I don't like the ruffled bottom or sleeve caps. 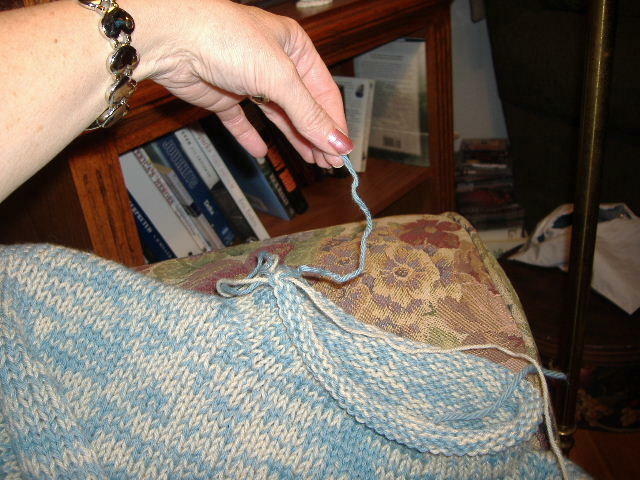 12. blue spiral cable pullover - there is not one thing I don't like about this. I'd wear it, I'd knit it, I'd buy that yarn to do it. 13. cascade 220 form fitting cardigan - someone pick me up off the floor. I think I fainted. It makes me want to lose more weight just to wear it. It's incredible. And I love Cascade 220.... especially when it occurs to me to buy enough of it for the entire project. 14. Chunky short cable cardigan... here again, love it, would wear it, would knit it, and I'd do it in that exact yarn. Sorry fiber snobs... but you have to admit... it looks great. 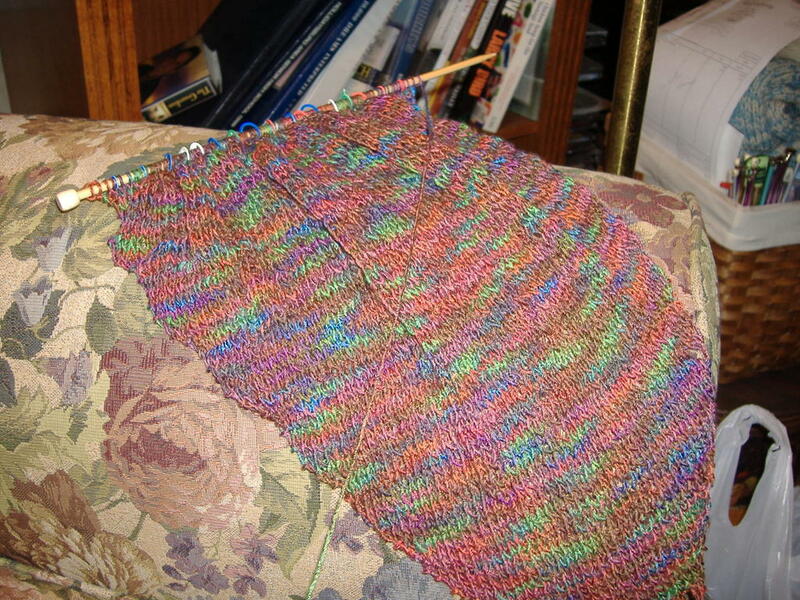 15. shawl - Well it reminds me of my failure: Michaela. I love it. It's fabulous. It would scare me after what I've been through with lace. Maybe ritalin would help. 16. Turkish cape - now that is just plain cute but I wouldn't go there. Too many color changes for me. 17. Rectangle wrap - just ho hum in my opinion. I'm not into fringey things. 18. Another lace shawl - I love it. I wish someone would make it for me so I wouldn't have to make it myself. 20. knit suit. - classy looking. I'd certainly never take the time to knit it and I probably wouldn't wear it once I did.... and wouldn't that JUST KILL YOU if you went to all that trouble? 21. black and white cardigan - this is so me it's scary. I have to talk myself out of buying black and white when I shop because I have a tendency to ONLY buy black and white. I think I'd be more inclined to buy a sweater like this than take the time to make it. 22. michael kors turtleneck - very nice. I'd wear it. My husband certainly wouldn't. 23. knit coat - awesome. I'd kill for that. (well, ok, I'm exaggerating) I just love it. But it's something I know I'd quit in the middle of. Big and boring knit.... but worth it in the end. 24. tiny tank - there's something about that that reminds me of Knitt.com's "W" that I have on hold right now. But I don't like that deep V on this one and I'd never wear it. 25. retro design vest thingy - wow... takes me back to high school. And that was LONG time ago. It's cute. I think my daughters would like it. 26 - seed stitch vest - I'm just not a vest person but that's cute. 27. slip stitch vest - very cute design, very cute. I wish I liked vests because that's one I'd do if I did. 28. checkerboard fair isle - another vest - cute, but not for me. 29. and 30. - sporty hoodies - They are just adorable. If I didn't work and had all the time in the world to knit, I'd do them for my daughters. I don't see that happening in this lifetime. 31. racer top - awww... that's adorable. I'd think about that for cate and kelly. 32. hooded pullover - love it. Love the design, love the color. It's so wearable. I'd make that. 33. - arm warmers. -they're kidding, right? arm warmers? really? arm warmers? I'd be laughing too if I had to model them. I knit for about 5 hours on Clapotis II yesterday. A few more rows and I'll drop the first stitch. The colors are nice and should go with about anything solid. And speaking of Clapotis.... I have been in search of a beige Sheath dress to go with my green one for months now and I came across one on ebay about a week ago. It was my size, new, AKA Eddie Bauer, so I ordered it. It came on Saturday and I can't believe my good luck. It fits like a dream, looks like a dream, and it's exactly what I wanted. And are you ready for this???? It was $17.99!!!! It will be perfect for some functions that I have coming up in the near future. Things like that usually don't happen to me. I was evaluating my yarn stash over the weekend. It's out of control. So, I am vowing NOT to buy any more yarn (except the Irish yarn for Rogue) until after I use up at least half of this stash. It's taking over my spare room AND my living room. There should be some sort of an organization to help people with this addiction. Hi. My name is Holly and I'm addicted to yarn.